Apparently, my main topic lately is eating. To be honest, when I'm home and the Roommate is also here, eating is the main entertainment of the day. There are few things I love more than food. This is nothing new and definitely isn't a new Belgian hobby. I just happened to start living with a guy who might match my fervor for food. He'd actually disagree: I read blogs and articles about food. I talk about food. I dream about food. He simply really likes to make and eat good food. After the past few weeks of super heavy eating, I'm trying to dial it back a little. So here is a glimpse at my eats now that we are into the new year. Breakfast: To know me is to know that I love eggs. Any way, any meal, all day. I'm one of those people who see them as the perfect food and I typically eat a few eggs for breakfast most days. I'm also a fermenter. For this photo, I added homemade pickled red onions and fermented red peppers. The only exception to my egg eating is when I'm insanely busy, at a race hotel that doesn't have eggs (or already added milk or cheese) or I'm just too lazy. Lunch: Some days, I have a mid morning snack, some days no. For lunch, I typically need something fast. Even though I work at home when I'm not at a race, I don't really take a lunch break. So I look for something I can throw in a pan and return to 5-10 minutes later. 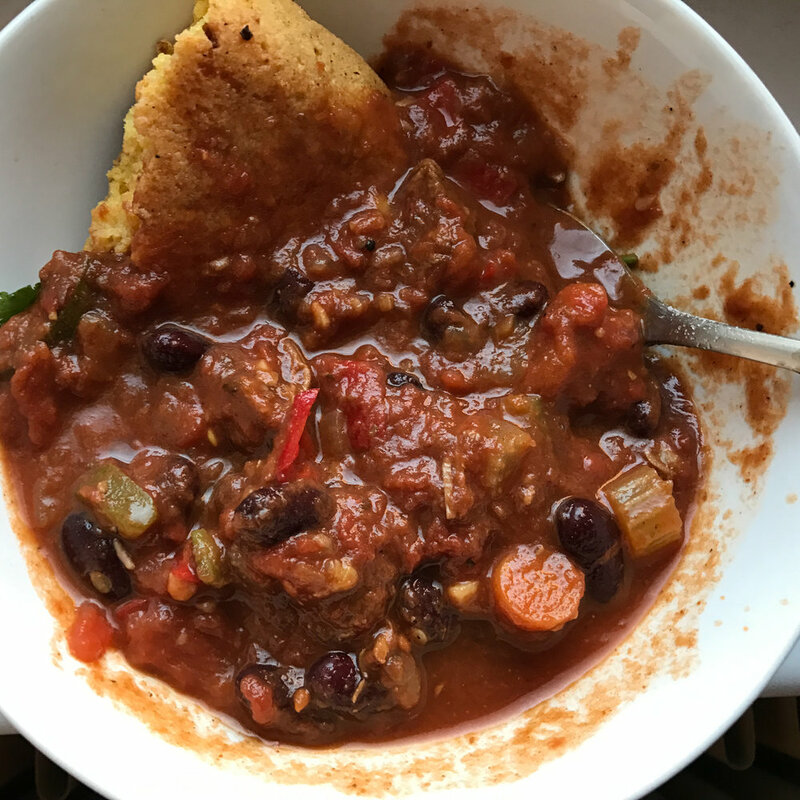 Today, it was leftover chili with homemade gluten-free, dairy-free cornbread. The bread was a bit too dry but the chili was fantastic. Post-Lunch: A glass of water kefir. This is my super crunchy granola hippy side showing through. I make my own water kefir. This is flavored with raisins and vanilla and taste just like cream soda. Healthy and insanely tasty. Afternoon Snack: Half a perfectly ripe avocado with salt and pepper. Dinner prep: Making dinner together is one of the roommate and I's favorite past times. We have a super small kitchen but we've figured out how to work well together without stepping on toes. Dinner: This is my new favorite meal. We actually started with the plan to make a taco salad and it morphed into Romaine Lettuce Tacos. Filled with baked chicken, corn, beans, roasted tomatoes, loads of cilantro, avocados and a sauce with soy yogurt, vinegar, and more cilantro. I felt like I could eat to my heart's desire and it was all so healthy and tasty.